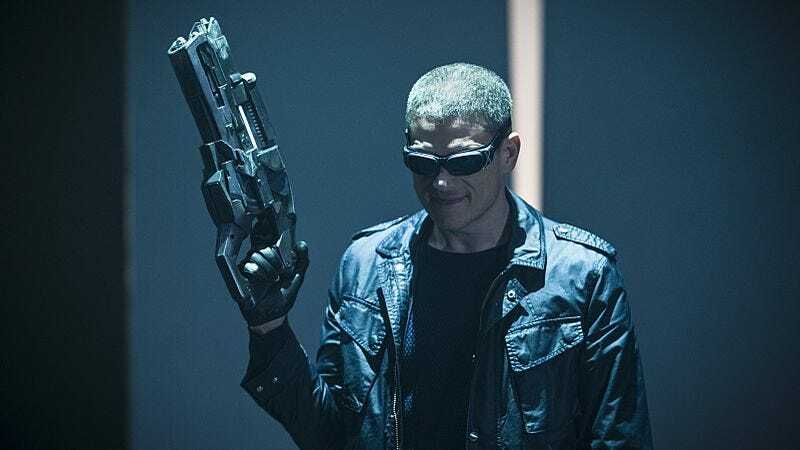 A moment of silence for everyone’s favorite snarky bad boy: Leonard Snart, you will be missed, you deliciously hammy villain-with-a-heart-of-gold. 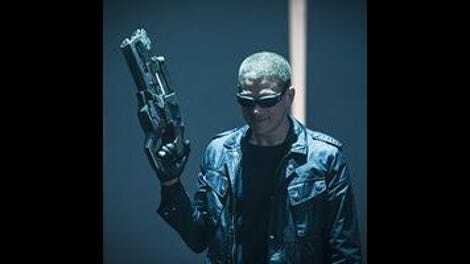 Though not for long, apparently, as word has already come out that Wentworth Miller will be recurring on the upcoming seasons of DC’s Legends Of Tomorrow and The Flash. While the unwillingness of the Greg Berlanti-verse series to commit to deaths can be frustrating, here the decision comes as a relief. Miller has been a consistent highlight for Legends and a welcome presence whenever he’s appeared on The Flash. Killing Snart off permanently to bolster the end of a lackluster season of Legends would be a waste, but taking advantage of the location of his death—over the Oculus—to technobabble a way out of it lets the episode maintain its gravity while still allowing fans to eagerly await his return. Snart’s death in “Destiny” works incredibly well, completing the character’s journey from villain to sacrificial hero and adding weight and stakes to the show as it moves into the season finale. Destroying the Oculus is a game-changer, and a win that big had to come at a price. A lack of stakes has plagued Legends all season, so seeing this episode actually hold its ground and give the team a bittersweet victory, rather than a full-on triumph or yet another defeat, is refreshing. Less so is the reveal that the team’s many failures this season have been intentional orchestrations by the Time Masters. Had each episode been satisfying on its own merits, this twist may have played well. Unfortunately, after pushing through filler episodes and repetitive storytelling, the last thing the audience wants to hear is that the show’s adventures being underwhelming was intentional. It lets the characters and the writers off the hook and leaves one with a sour taste in one’s mouth. If the characters only have free will in these last two episodes of the season, what was the point of soldiering through the previous ones? The failures of previous episodes are made all the more glaring by the success of “Destiny.” By far the best episode of the season, this penultimate episode features a stronger narrative, better structure, more stylish direction, and more interesting character dynamics than the rest of the season to this point. The episode opens by reestablishing where the characters started, highlighting how far Jax and Martin have come while laying the groundwork for Snart’s sacrifice. It immediately surprises viewers by focusing in on Jax, too frequently overlooked in this large ensemble, before cutting back to the Vanishing Point and splitting up the group into more manageable pairings. The characters are given potent, personal obstacles to face in Savage, Mick’s torture and the prospect of becoming Chronos again, and the crushing revelation of the future the Oculus shows Rip. Counterbalancing that are Sara and Snart who, along with PastMartin and Jax, provide some much-needed comic relief. The episode jumps neatly between each group as necessary, keeping the momentum up and toggling effectively between drama and escapist adventure. Then, just as the narrative threatens to bog down, Sara and Snart save the day and the team (minus Jax, Kendra, and Carter) is reunited. After the revelation that they’ve been passive figures in their lives to this point, letting the team be proactive is crucial to the episode’s success and busting them out of the Vanishing Point halfway through, rather than later on, is a great call. It also leaves plenty of time for action, and watching the team go at it against the Time Masters, particularly once Jax swoops in to save the day, is a lot of fun. The hero-off at the Oculus—with first Ray, then Mick, and finally Snart competing to be the episode’s sacrificial button presser—may get a bit ridiculous, but “Destiny” earns Snart thwacking Mick upside the head by following through on his death, and having Sara give him an earnest kiss goodbye. Miller and Caity Lotz have had fantastic chemistry all season (though to be fair, both have oodles of chemistry with everybody) and their final moment pays off the episode’s buildup, and their connection all season, nicely. Just as important to the episode’s weighty ending is the revelation from Gideon that newspapers report Rip’s family has indeed been murdered. Not only have they lost Snart, but Rip’s family’s death is now fixed in time and can’t be altered. These heavy losses makes the characters’ need to save Kendra (and Carter, I suppose) all the more powerful and sets up the finale incredibly well. It’s not much different from the rest of the season: The team wants to find and stop Savage, rid the timeline of a tyrant, and save Kendra and Carter from lifetimes of his persecution. And yet, because of the episode it comes after, the team’s renewed quest feels urgent and meaningful. DC’s Legends Of Tomorrow couldn’t have asked for a better setup to their season finale. Now all they need to do is deliver on it. A big thank you to Oliver Sava for letting me fill in for “Destiny!” I honestly did not know the show had this in it. Instrumental to the success of this episode is the direction by Olatunde Osunsanmi, who uses stylish and effective angles throughout—a favorite being the shot of the team sauntering in to the Oculus—and makes great use of closeups as well, notably during Sara and Snart’s standoff. The editing for Rip’s glimpse of the Oculus works well, as do the visuals for Mick’s torture, and the action is easy to follow, while retaining its energy and momentum. Basically, Legends producers, hire Osunsanmi again for season two, then send him over to The Flash and Arrow for good measure. Some will disagree, but for me, Jax’s forgiveness of Martin for drugging him in the pilot manages to walk the line, acknowledging Jax’s change of heart without pretending Martin was anything but wrong for doing it. Yes, the scene can be read as Jax giving Martin the idea in the first place, but I choose to believe Martin would’ve done so anyways. Ray likes cupcakes! People in ridiculous shape on television rarely mention working out or keeping to a diet. It’s lovely to find out Ray would stuff his face with carbs if he had Supergirl’s metabolism. The line and delivery of the episode most definitely goes to Miller for, “Started to wonder what the future may hold for me. And you. And me and you.” I wasn’t a Sara and Snart shipper before this episode, but I may well be one now.